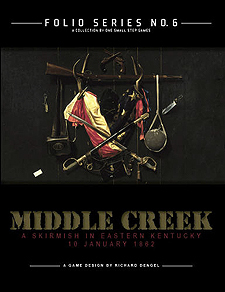 On 10 January 1862, between 1 and 5:30pm, in a fight that largely determined the fate of eastern Kentucky, two small armies clashed along the swollen tributary of Middle Creek. An officer of some promise, Humphrey Marshall, generalled the CSA. A relative unknown commanded the USA by the name of James A Garfield. The CSA ensconced themselves upon heights overlooking Middle Creek. Superficially, their position seemed formidable, but they were cold, hungry, and ill armed for the coming battle. The fight soon became a fratricidal one, as two Union regiments from Kentucky led the change against rebel blue-grassers. It was a hand-to-hand affair, and though the CSA held their positions, they were battered and thoroughly demoralized. At the end of the day, Marshall had no choice but to withdraw. His supplies were thin and he was fearful of his army deserting. The battle unmade his reputation and he was barely heard from again. Middle Creek uses the Rebel Yell! game system. Each infantry or cavalry unit in the game represents about a hundred men, i.e. one or two Companies. Each artillery unit portrays a Section of 1 or 2 guns. The hexes on the 17 x 22 inch map scale to between 80 and 100 yards.